Today we celebrate the Solemnity of St. Joseph, the husband of the Blessed Virgin Mary and the foster father of our Lord Jesus Christ. This is a man who submitted His will to God and allowed God's will to be done in his life. He is a wonderful example of a good and responsible man. The promise of God to raise an offspring from the root of David whose kingdom and dynasty will be established forever as recorded in the first reading of today came to be fulfilled at the birth of our Lord Jesus Christ. 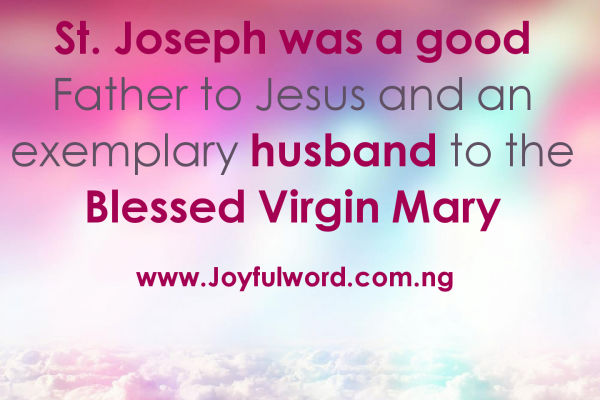 The role that Joseph played in the fulfilment of this promise was very significant, but sacrificial. He had to let go of his plans to marry the Blessed Virgin Mary when he realised that God was deeply involved in what was happening in her life. He was a humble, hardworking, prayerful, compassionate, just, considerate, simple, kind and understanding man. He wanted to do what the law says when he found out that Mary was with a child out of wedlock, but he still did not want to expose Mary to shame. God is the owner of our lives and He has right to make use of us when He wants and in any capacity, but we must be willing and ready like St. Joseph to allow Him to use us. we must not insist on our own will, but on the will of Him who knows the best and has the best plan for our lives. St. Joseph had the grace of self-control and he did not let the situation that confronted him to make him lose his temper or to act aggressively or violently towards the Blessed Virgin Mary. He played his role in the life of Mary and Jesus as a good Father and he showed good example to Jesus and never led Him astray. We must learn from St. Joseph to be virtuous parents and we must take seriously our parental role by showing good examples to our children so that they will grow up knowing God's way and living their lives in accordance with God's law and commandments. Good morning dearest one. SmileðŸ˜Šas you do your work and do have a magnificent day. May the virtues of St. Joseph inspire you to step up your level of obedience and submission to God's will in your life. Amen. And May the Almighty God bless you: the Father and the Son and the Holy Spirit. Amen. Watch-Word: When Joseph woke from sleep, he did as the Angel of the Lord has commanded Him. A good man is a good man and a good woman is a good woman. We need good men and women in our world and you can be one of them. Step up your level of goodness today.